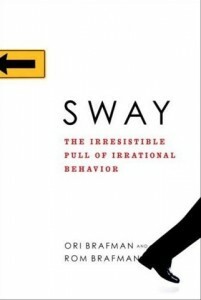 Ori and Rom Brafman’s “Sway: The Irresistible Pull of Irrational Behavior” is another excellent read on human behavior that can add to your understanding of how people make (or don’t make) decisions. There are reasons that seasoned professionals, from all backgrounds and disciplines, make otherwise senseless decisions; and none of us are immune. A successful businessman can hold on to a dying stock against the advice of his peers and professionals and lose his fortune. An ER doctor may just ignore everything she ever learned about patient diagnosis and cause the death of a child. An airline pilot can make a decision that goes against everything he has ever learned or taught about flight safety, ignore the warnings of his flight crew, and kill everyone on board his aircraft. But fortunes and lives don’t have to be at stake for irrationality to have an effect on our daily lives. “Sway” explores how the power of our aversion towards loss, our dedication to fairness, the power inherent in groups, diagnosis bias (prejudging a situation), and value attribution can ruin our decisions about everything from compensation plans and hiring decisions to the price we pay for groceries. Though the Brafman’s book does seem to rehash some of the same research covered in books like “Blink: The Power of Thinking Without Thinking” by Malcolm Gladwell and another must read “Deep Survival” by Lawrence Gonzales – it provides fresh perspective on how irrationality can be predicted and possibly avoided in all areas of your life.